In the course of the excavation process in Can Sadurní cave (Begues), members of the Col-lectiu per la Investigación de la Prehistòria i l'Arqueologia del Garraf-Ordal (CIPAG), together with the University of Barcelona Seminar of Studies and Prehistoric Research (SERP), found the torso, with one complete arm and the initial part of the other, of a human figurine made of pottery. 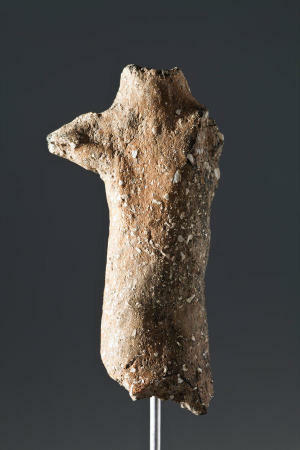 Its chronostratigraphic unit makes it, until now, the most ancient human figurine of the Prehistory in Catalonia; it is dated 6500 years ago. The existence of a left arm is quite obvious because of the loosening fracture observed on the opposite side. It is hoped that this arm will be found in future excavations. Both arms are holed vertically. This feature indicates that the original position that the artisan imagined was the one of a figurine hanged from a cord or a leather strap. The cord might have been used in order to hang the figurine on a person's neck or on a site inside the cave. The figurine's neck is nearly all preserved and, as most of that time figurines, it is possible that the head was mobile and interchangeable, in order to fit it into the neck's hole. A careful observation allows identifying the figurine's breast and back: on its back there is a central and vertical depression which marks its spine and shoulders. The position of the longitudinal section of the right arm indicates that the arms are stretched out, in a reception attitude. In addition, pelvic area has an angle that is less than 180º between the waist and the beginning of the lower limbs what makes think that the figurine was in a sitting down position or with the legs bended. It is unknown how the legs end but probably they do in flat feet, as it happens in a great number of figurines found from France to Near East, going through Italy, the Balkans and Anatolia. We hope that next excavation works document other fragments of the figurine to better understand the whole artefact. All the know factors show that the figurine has a great symbolic and spiritual value. Generally, literature about this kind of images considers them to be images with divine attributes. To sum up, all its characteristics points towards what, in prehistory, can be defined as an idol. Researchers took into account this magical religious component, and the fact that traditionally Begues inhabitants have always received the nickname Els Encantats (the enchanted), in order to name the figurine as el Encantat de Begues. Can Sadurní excavations are with the project "La prehistòria al sud-est del Llobregat. De la costa al massís del Garraf-Ordal," coordinated by the professor at the UB Department of Prehistory, Ancient History and Archaeology, Josep Maria Fullola, and the prehistorian and archaeologist Manuel Edo, the CIPAG president. The excavations, led by the researchers Manuel Edo and Ferran Antolín, are supported by the Begues Town Council, the Culture Department at the Government of Catalonia and the Centre d'Estudis Beguetans, as well as by other organizations and local enterprises, such as the caves Montau of Sadurní, where the cave and Can Sadurní masia are located.